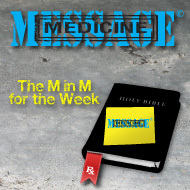 Each week Bishop King will have a unique word about the Medicine found in the Message. The scripture is full of great ideas that can serve each of us as a healing source or our Medicine. With a new text highlighted each week, check back often to see what medicine is in store for you!